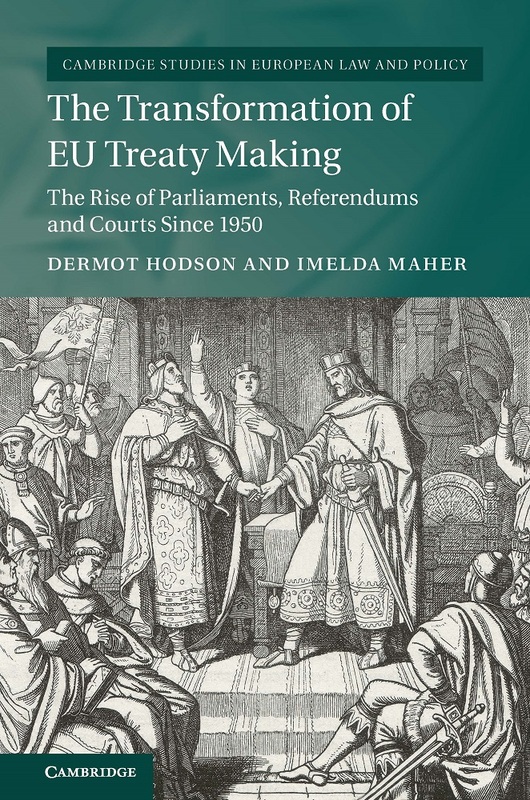 Dr Dermot Hodson, Reader in Political Economy in Birkbeck’s Department of Politics, discusses the rise of parliaments, the people and courts in EU treaty making, the subject of his new book with Prof. Imelda Maher. Treaty making is a site of struggle between those who claim the authority to speak and act on international matters. Being closely connected to questions of war and peace, the power to make treaties in medieval times lay to a large extent in the hands of monarchs. Modern treaties are negotiated by states, although not exclusively so. The conference that produced the Paris Agreement on climate change in 2015, for example, had more than 25,000 delegates drawn from governments, international organisations, NGOs and civil society. The European Union (EU) is fertile ground for students of treaty making. This is not only because the Union’s frequent recourse to treaty amendment is so publicly contentious, as evidenced by the Eurosceptic backlash against the Maastricht, Amsterdam, Nice and Lisbon Treaties. The EU has also witnessed fierce competition over who has the right to negotiate treaties. The 1951 Treaty of Paris, the EU’s founding treaty, was negotiated in a tightly sealed intergovernmental conference. Today, the European Parliament and national parliaments, have a seat at the table alongside governments when major EU treaty revisions are negotiated. This competition extends to the question of who should approve EU treaties. National parliaments endorsed the Treaty of Paris on the basis of simplified majority votes. No member state held a referendum and none saw court challenges before the treaty took effect. Now, most member states need a parliamentary majority of three-fifths or higher before they can approve a major EU treaty. Treaty-related referendums are relatively commonplace in the EU, as are prior constitutional reviews of treaties before higher courts. The UK, although it is leaving the EU, exemplifies the changing constitutional rules and norms surrounding EU treaty making. Citizens have already used the courts to reaffirm the need for parliamentary approval of the UK’s withdrawal treaty. The campaign for a second referendum, meanwhile, shows that Parliament’s right to decide on the terms of Brexit is heavily contested. This book explores this transformation of EU treaty making over the period 1950 to 2016. Drawing insights from EU law, comparative constitutionalism and international relations, it considers how and why parliaments, the people and courts have entered a domain once dominated by governments. It presents qualitative and quantitative evidence on the importance of public trust and political tactics in explaining this shift and challenges the idea that EU treaties are too rigid. Our study shows how governments, having tentatively deviated from the traditional intergovernmental conference format in the 1950s, did so conclusively from the 1990s onwards. This shift was driven not only by the European Parliament’s insistence that it be involved. It also reflects a turn to more participatory modes of treaty making as the problems of legitimacy facing the EU mounted. The involvement of parliaments, the people and courts in approving EU treaties is sometimes seen as an attempt by national governments to boost their bargaining position. Our analysis of the changing constitutional rules and norms surrounding treaty making in the EU’s 28 member states over six decades supports this view. The EU thus offers a rare case of governments ‘tying their hands’ in international negotiations, something that Robert Putnam theorised in his work on two-level games but which has rarely been seen in practice. Trust is at play here as well as tactics, our findings suggest. Member states that saw declining public trust in national government tended to give their parliaments a greater say in EU treaty making. Those that saw declining trust in the EU were more likely to allow referendums and constitutional challenges. In this sense, member states are not only engaged in a two-level game when they revise EU treaties. They face, what we call, a problem of two-level legitimacy. Governments, though they remain key players in EU treaty making, do not legitimate this process as they once did because their own legitimacy and that of the Union is open to question. Should the EU make treaties differently? The consensus in the literature is that EU treaty making should become easier, with recurring reform ideas including the approval of treaties by a majority of member states, restrictions on national referendums and a pan-European referendum. We question this consensus. Our findings show that the rate of treaty revision has slowed as parliaments and the people have assumed a more prominent role in this domain but that it has by no means ground to a halt. Viewed from a two-level legitimacy perspective, there is a case for making it more rather than less difficult to revise treaties. This book explores a range of reform ideas, including citizen-led treaty making, time-locks on treaty reform and greater judicial and parliamentary oversight. It asks whether allowing EU treaties to fail, rather than saving them at all costs, is a more appropriate response to the problems of legitimacy facing the EU. Dermot Hodson is Reader in Political Economy in Birkbeck’s Department of Politics. Imelda Maher is the Sutherland Full Professor of European Law, University College Dublin. Their book The Transformation of EU Treaty Making: The Rise of Parliaments, Referendums and Courts Since 1950 is published by Cambridge University Press.